The Elmsford Fire Department is 100% volunteer, 24 hours a day, 7 days a week. We train continually, learning the latest skills in firefighting and emergency medical treatment, providing the highest quality Fire and EMS service to the Village of Elmsford and our Fire Protection Districts. 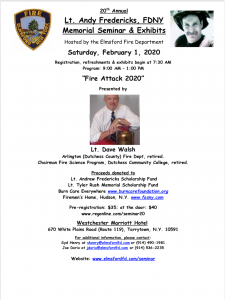 Located 20 minutes north of New York City, the Elmsford Fire Department is comprised of two companies: Our ladder company: Elmsford Fire Company #1 and our engine company: Live Oak Engine Company #1. We are always looking for new members to be a part of this great team. I hope you find our site informative; and again, I thank you for stopping by. Juniors’ Open House, Sunday August 19th. Structure fire @ 26 South Lawn Ave. Carbon Monoxide Incident @ 99 Sears Ave.